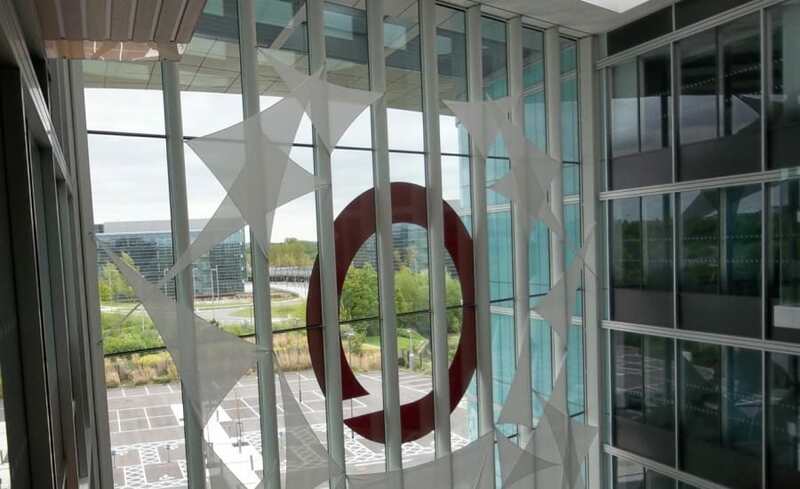 A large provider of biopharmaceutical development, had a sunlight issue in their ultramodern new UK headquarters. 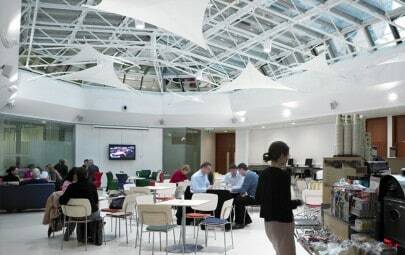 The sunlight glare from the five story glazed entrance wall flooded the building, creating a problem for staff on reception. Viewing computer screens and greeting visitors to the building was difficult with the constant glare. Sunlight was also heating up the space requiring air conditioning systems to work overtime. The client approached Architen with an idea for fabric sails which would serve as a decorative shade system for the glazed wall. 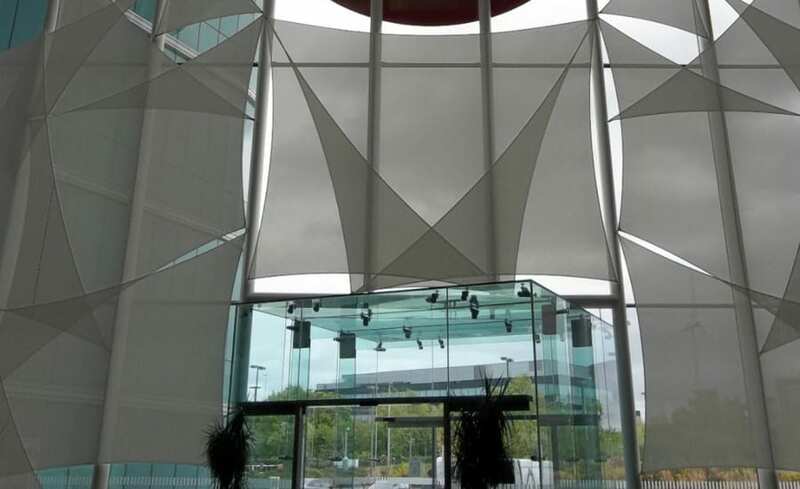 Besides looking stylish and effectively reducing solar glare, their other main requirement was for sails to be able to be removed for annual window cleaning. 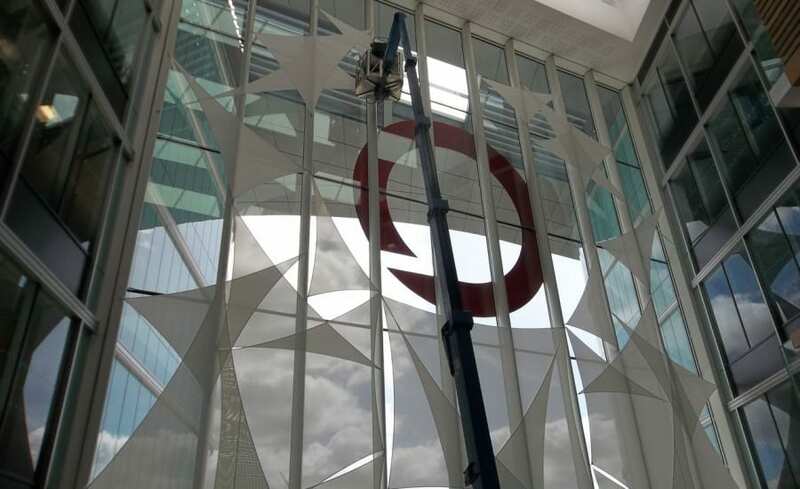 With a two story logo on the centre of the glazed wall, Architen’s design team followed the lead of our client and created a series of fabric sails around the large corporate logo. Having conducted sun plotting, we knew the majority of the sun was entering the building below the logo, along the lower quarter of the glazed wall. With that knowledge, we increased the number of sails covering the glass, ensuring there was just the right amount of overlap to block out the bulk of the sunlight. 25 sails were designed, patterned, manufactured and installed. 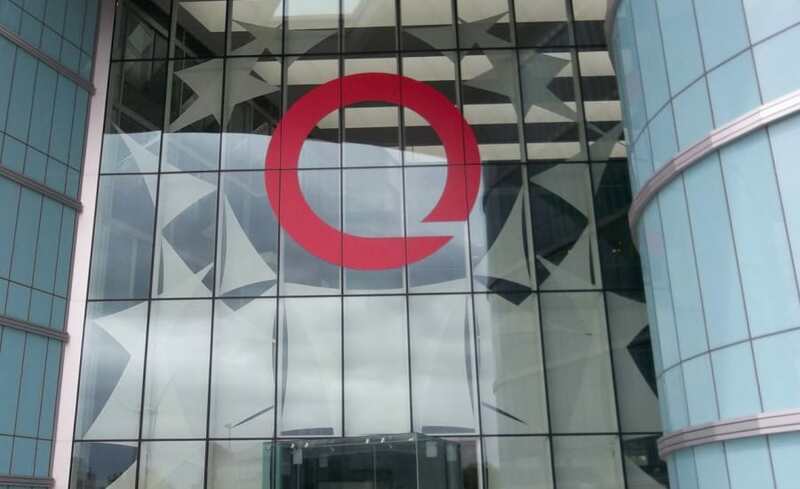 11 sails on each side of the logo are a mirror image of the ones on the opposite side, while three large sails fill in the space below the logo over the glass entrance box. Selecting the right fabric was important. 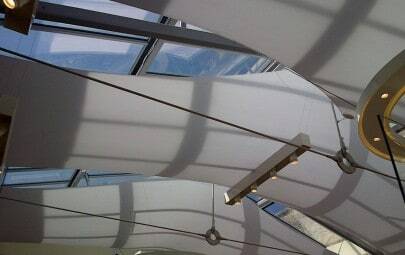 Architen recommended a PVC glass mesh fabric because it provides the perfect amount of solar glare reduction. 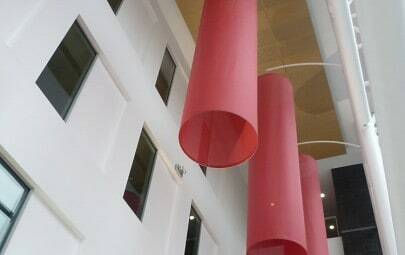 Sails were installed using architectural polished stainless steel karabiners clipped to stainless steel eyebolts. Each sail was literally clipped into position following a very specific installation guideline. This guideline will allow the client to remove the sails for window cleaning and install them back in the exact right position. With the tops of sails connected nearly 20m high, this interior job required specialist lifting plant with trained operatives. Project Manager, Jason Smith, said this about the installation: Working at heights always has its challenges; however working inside a tight space with a very heavy mobile elevated working platform (MEWP) can be even more difficult. Luckily we are experts in what we do and the installation was smooth.